The title page from the first printed edition of the acts of parliament produced in 1542 and printed by the royal printer of Scotland Thomas Davidson. The statutes are those of the preceding 1540 parliament under James V. It would be the 1560s before an edition was printed which covered all legislation going back to 1424 and James I. The playwright Sir David Lindsay of the Mount, Lyon King of Arms, may have designed the woodcut. Parliament met at a variety of towns and places before the 1630s, but its most common venue was the Tolbooth of Edinburgh, normal home of the town council, burgh court and chief prison of the capital. The above engraving from the eighteenth century/early nineteenth shows the Tolbooth to the north of St. Giles Cathedral by which time it was merely a prison. The building, considered to be an eyesore, was destroyed in 1817, although the position of its front door (visible in this picture) is still marked by the ‘Heart of Midlothian’, a pattern of stones in the pavement by the cathedral. The parliament at last had a permanent home with the opening of the Parliament House which was begun in 1632 and completed in 1639. This building still survives, though not much of the grand courtyard to the east, and has since 1707 been the home of the Court of Session, the Parliament Hall forming a grand lobby for the court. The above engraving was completed by James Gordon of Rothiemay (1615-86) shortly after the building was completed. To the right can be seen the great door of parliament at which proclamations and summonses were read. The above plan of Edinburgh, penned by James Gordon of Rothiemay in 1647, shows St. Giles Cathedral sandwiched between the Tolbooth to the north and the Parliament House to the south running at right angles to the cathedral. The greatest ritual of the Scottish parliament was the ‘Riding of parliament’ in which the members moved by procession to and from the parliament whether it met at the Tolbooth or Parliament House. This illustration by Chalmers, herald painter of James VII is one of a series which captures the procession by foot and by horseback of members and their retinue making their way to the parliament of 1685. The above illustration taken from Nicolas de Gaudeville’s Atlas Historique (1720) shows the procession on foot to the parliament house after dismounting at the east end of St. Giles. The picture shows parliament as it would have been in the 1680s. The above detail, from the Gaudeville illustration, shows the internal layout of the parliament chamber. 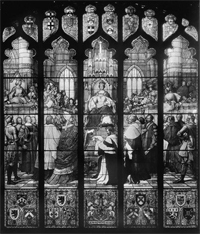 The throne to the top centre, clergy to the left, earls and barons to the right and the shire and burgh commissioners at the back (foreground) facing the throne. The title page from the printed laws and acts of the 1661 parliament in the reign of Charles II. [Reproduced courtesy of the National Records of Scotland].